In 1954 West Germany began to implement its plans to raise new German armed forces. After technical trials and extensive troop trials, the decision to procure the light all-terrain vehicle offered by Auto Union/DKW was made in the spring of 1956. Series production of this LKW 0,25 t gl (4x4) Auto Union/DKW F 91/4-900 Munga began in October 1956. From 1958 onwards the more powerful F 91/4-1000 Munga and the longer F 91/8-1000 Munga were introduced. 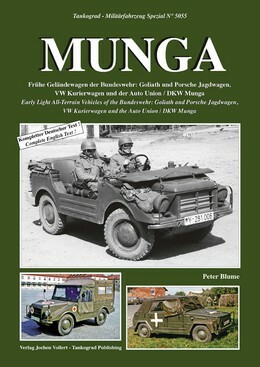 This publication shows the development, technology, variants and active service use of the Munga in great detail. Additional chapters cover the early Bundeswehr's rare Goliath Jagdwagen, Porsche Jagdwagen and VW 181 Kurierwagen. Quantity Photos and Illustrations: Illustrated throughout with 97 b&w photographs, 30 colour photographs and 5 graphics.